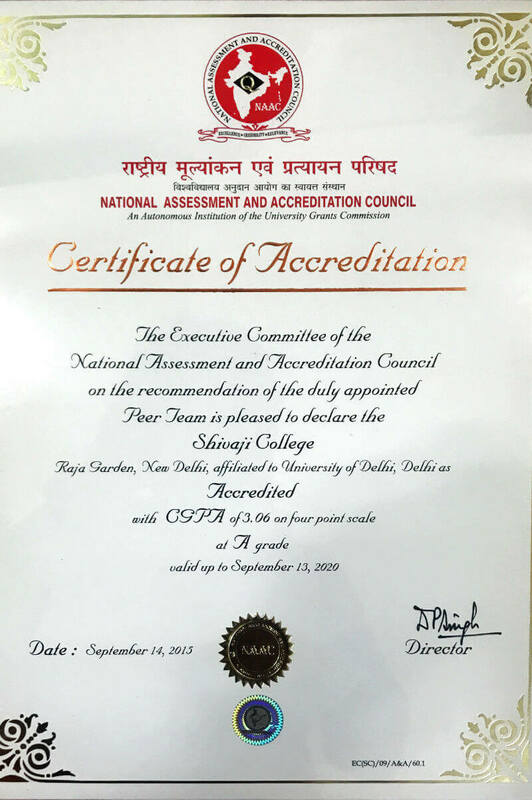 Shivaji College has been accredited with Grade "A" by NAAC. IQAC was set up in February 2015. The main function of the IQAC is to develop a system for conscious, consistent, and catalytic improvement in the overall performance of the college. It constitutes committees for smooth functioning of academic, administrative, and financial activities. It coordinates with all stakeholders at various levels: through informal interaction, official meetings, feedback system, etc. IQAC undertakes academic and administrative auditing by internal committees. Its main objective is to plan and implement quality initiatives and evaluate the same. It analyses the feedback received from all stakeholders and informs the person concerned about its outcome for improvement. It also appreciates, encourages, and provides support required by all staff for their quality sustenance and improvement in teaching, research and administration. Scrutinising each Department in detail regarding results, syllabi covered, and time table adherence. Ensuring successful implementation of the corrective actions by the Departments. Ensure timely, efficient and progressive performance of academic, administrative and financial tasks.